A near scale model based on the full sized cessna aircraft and designed around the popular .40 size motors. This model provides the modeller with the best of both worlds, its both an easy to fly, relaxing Sunday flyer or, with the more powerful motors , an exciting aerobatic sports model. Relatively eady to build, it retains all the atmosphere of the full size Cessnas without any complex scale construction. 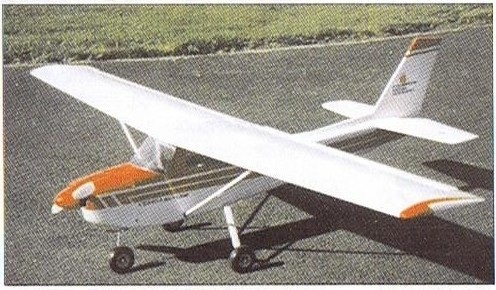 The Cessna also makes an ideal aileron trainer. Pre-cut ply and balsa parts. Pre-sectioned leading edges, rear spars and ailerons. Veneered foam wings. Pre-formed undercarriage, motor mount, fairings control cables and fittings. A full sized plan and instruction book. For .35 - .40 2-stroke motors or .48 - .53 4 strokes.